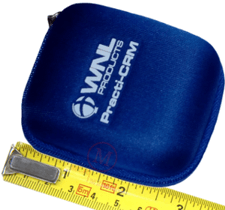 The Practi-CRM comes in a small blue zippered storage case proudly bearing the WNL Products name and logo on a side. CPR instructors will likely recognize the WNL brand for providing popular items like the AED Practi-Trainer, Practi-Valve, and Practi-Shield. At only 3″ by 3″ by 1.75″ the Practi-CRM is small enough to squeeze in with your other gear. The durable case is firm enough to offer protection even if it gets banged around a bit. Plus, instructors that have to lug their gear around a lot will appreciate that it weighs under 2 ounces. The product includes the protective case, the Practi-CRM feedback device (battery included-see note below), and an instruction card. If you read the instruction card (like we’re sure everybody does) you’ll find that it mentions a 4-pack model. This item is unfortunately no longer available from the manufacturer. While we still offer a 4-pack in our store, we provide 4 individual CPR feedback devices. The only way that differs from what’s shown on the instruction card is that in our 4-pack each Practi-CRM comes in its own case. The advantage to buying the 4-pack is a lower per-piece price. Special Note: While the Practi-CRM comes with a CR2032 coin battery pre-installed, it has a small plastic battery protector in place that must be removed prior to its first use. Follow the battery replacement instructions on the instruction card to access the battery and remove the protector. This Practi-CRM is worn on the wrist when performing compressions. Its watch-like design has a band that springs closed gently on wrists of all sizes. With the clasp-less style it’s extremely easy to take on and off. 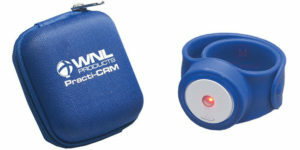 Note: The instruction card points out to wear the Practi-CRM with the LED indicator on the outside of the wrist, and with the power button on the side closest to the wearer’s elbow. See the image below. This wrist-worn feedback device uses an LED indicator light to provide instant compression rate feedback to students and instructors alike. When the student performs compressions too slow or too fast, the LED lights up red. When performing within the AHA prescribed range, the LED lights up green. Note: The unit can be turned off using the power button, but will also power itself off automatically after 3 minutes of inactivity. Who Can Use This CPR Feedback Device? One thing to note is that the Practi-CRM does not provide depth feedback. This product is intended for instructors who already have manikins equipped with depth clickers, but not rate indicators. When asked about this, WNL shared with us that many manikins on the market already have “clickers” that provide depth feedback, and that their customers primarily needed an affordable option to provide just the rate feedback. We looked around at other stand-alone wearable CPR feedback devices, and it’s easy to see why WNL chose to keep their product simple and affordable. Other devices that provide both rate and depth feedback cost more than brand new manikins with feedback built in! Feedback options are different between CPR manikin brands and models and some instructors already have manikins with depth clickers, but don’t have rate feedback. The Practi-CRM is a good way for these instructors to meet the AHA requirements. And at $27.95 it won’t break the bank. WNL Products is a reputable manufacturer who specializes in CPR and first aid training equipment, so we expect the same durability out of this product. While the Practi-CRM comes with a 1 year manufacturer warranty, like all products we carry at MCR, we’ll stand behind the warranty ourselves. We don’t expect you to have trouble, but if you do, call us and we’ll take care of everything, including paying for postage ourselves. Stop by our store and check out the Practi-CRM today! If they are being worn on someone’s bare wrist, how are they cleaned afterwards? Great question. I recommend using a disinfecting hand wipe during the class and then once you get home or back to your training center follow up with a more thorough wipe down. will these meet the new AHA standard for 2019? I have multiply manikins and I am trying to find a way to salvage them. I have the same question, do they meet AHA 2019 standards? The Practi-CRM provides rate feedback, which is one of the two types of feedback required by the AHA. The manufacturer designed this unit for instructors who already have manikins with depth feedback (clicker), but don’t have rate feedback. The Practi-CRM uses a CR2032 coin type battery that can be purchased from local stores. Prices vary, but quality brands will be from $1.50 to $2.50 a piece when purchased by the pack. Good question. The manufacturer indicates that this depends on usage, and we don’t have a more detailed answer yet. We have a couple that we’ve had opened for a few months that still have good batteries, but we’ve only used them for demonstrations. We’ll reach out to people who use them more than we do to see if they can provide some real world feedback. Thanks for asking. Next Next post: Who Doesn’t Love a 50% OFF DEAL?